The Enhanced Mitigation Experience Toolkit (EMET) is designed to help prevent hackers from gaining access to your system. Software vulnerabilities and exploits have become an everyday part of life. Virtually every product has to deal with them and consequently, users are faced with a stream of security updates. For users who get attacked before the latest updates have been applied or who get attacked before an update is even available, the results can be devastating: malware, loss of PII, etc. 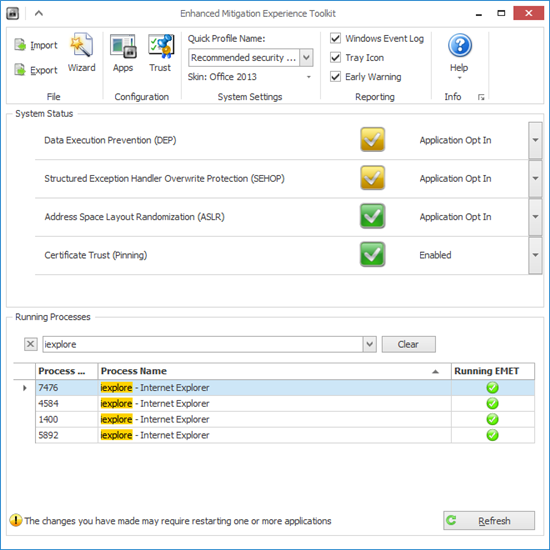 New features introduced in EMET 4: Certificate Trust, mitigations improvement hardening, and the Early Warning Program. Redesigned User Interface: We realized that with the addition of the new features introduced in EMET 4.0 Beta, the old graphical user interface was not as effective and easy to use. For this reason, we decided to re-design EMET’s GUI to facilitate and streamline the configuration operations. We also added the possibility to select the look-and-feel of EMET from a set of skins that we included. Configuration Wizard: We know that configuration can be challenging when installing EMET for the first time. 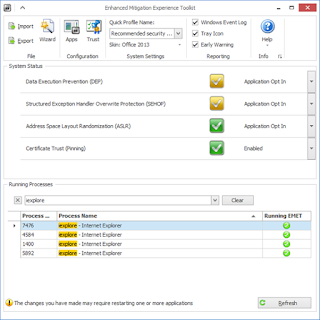 In EMET 3.0 we added the Protection Profiles, which were used to facilitate the initial configuration for applications. With EMET 4.0 we are introducing a Configuration Wizard that will automatically configure EMET with a standard set of SSL certificate pinning rules as well as a list of applications to protect. It also can preserve existing EMET 3.0 settings, and gives the possibility to add standard configuration for the new features. The Configuration Wizard will start automatically during EMET’s installation and can also be accessed, at any time, from EMET GUI. Advanced users can choose to apply a standard configuration through the Configuration Wizard and then customize EMET’s configuration afterwards according to their needs. Changes in Certificate Trust: We made a few changes to the Certificate Trust feature, based on users’ feedback, further internal investigation, and partnership with third party online services. We added a new exception to the SSL certificate pinning rules that if enabled will make EMET verify just the Public Key component of the Root CAs present in the rule without matching subject name and serial number. Additionally, we made the Certificate Trust feature available on 64-bit versions of Internet Explorer. Finally, we added to the previous default rules for Microsoft online services new rules also for Twitter, Facebook, and Yahoo!. Updated Group Policy profiles: Enterprise customers will notice that we updated our Group Policy profiles to include not only the ability to configure system and application mitigations, but also the reporting mechanisms, the advanced mitigation configurations, and the exploit action.